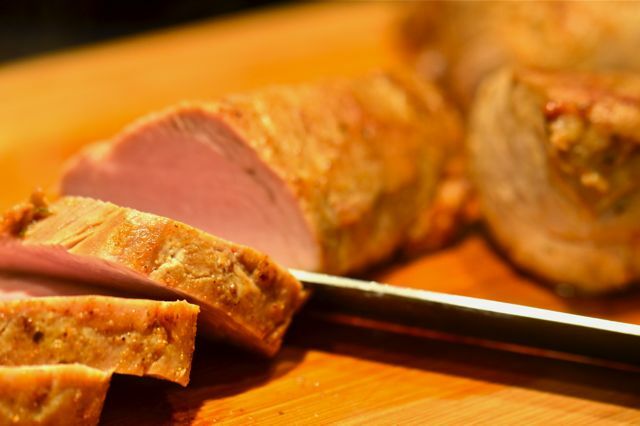 Brined and Spiced Pork Tenderloin. Ok, now that we got that out of the way….If you’ve read this blog a bit, it becomes pretty clear that we are big fans of low-and-slow pork dishes here at the farm. And while we would smoke and pull pork every week if our schedules and waistlines allowed, sometimes we need other options. And for quick(er) pork dishes we look to chops and tenderloins. 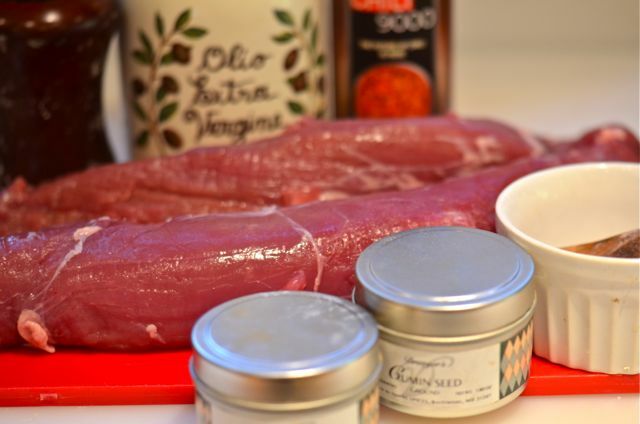 There are few easier dishes to prepare than pork tenderloin. Put a quick sear on it, pop it in the oven for a few minutes and you’re done. And sometimes it’s pretty good, and sometimes it bone dry and lacking flavor. And there are a number of reasons why things don’t always work out. 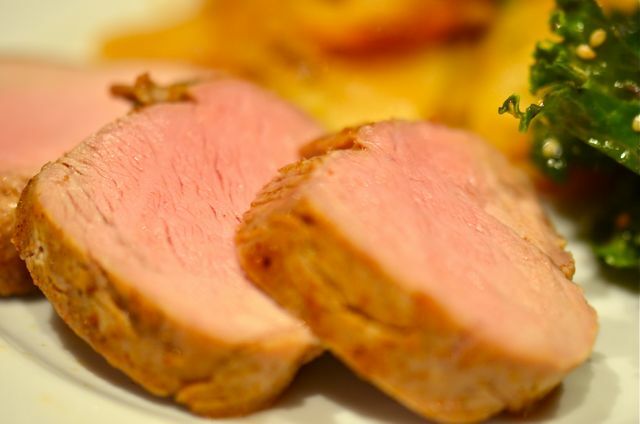 Basic overcooking is the obvious reason for dry and flavorless pork, but also the size, shape and liquid content of the tenderloin come into play. But there is a simple way to make leaner pork cuts tasty and tender every time, brining. 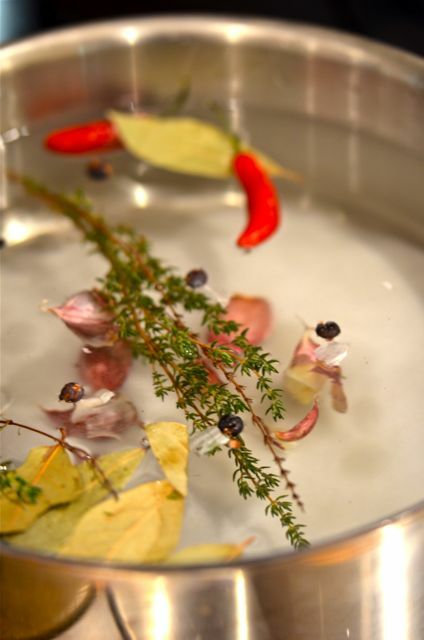 A brine is simply a combination of water, salt, sugar and your choice of herbs and spices. But when you add meat, the brine performs some pretty cool magic chemistry that greatly improves the tenderness, juiciness and flavor of almost any cut. (Here is a good link that describes the science without getting too geeky). The only issue with brines is that they will dry out meats if you brine them for too long, but as long as you follow the recipe or the standard times for brining, it isn’t a risk. 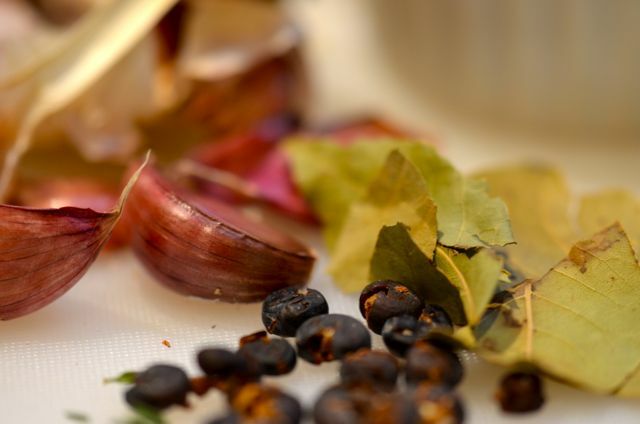 Many cooks think of brines helping with large roasts like turkey or pulled pork, and the brining lasting for days. But for small cuts like pork tenderloins, even 45 minutes will help, and a few hours will do wonders. Opinions on the times for brining pork tenderloins vary from forty-five minutes to four hours. The shorter times will still make the tenderloin juicy and tender, but not impart much extra flavor. The longer times will add some salt and flavor, perhaps too much salt for some. Two hours is a good starting point. The other variable in the brine is adding extra flavors. Technically, all you need is water and salt, but sugar, herbs and spices will boost flavor. 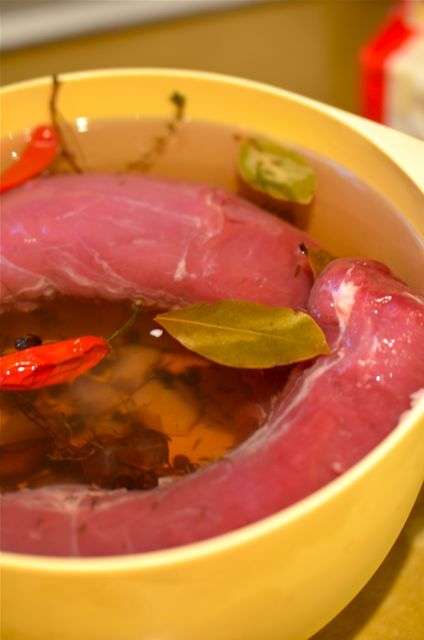 We suggest you tune the brine based on the type of meat and your tastes. But, in general, sugar, garlic, thyme, and bay leaf seem to work in most brines. Black pepper and chili peppers add some extra bite. We do suggest caution with strong or “piney” herbs like sage, oregano or rosemary- as they may add bitter notes to the brine. Best to save them for any rub or marinade you put on the pork. And we do suggest an oil-based “rub” of oil, salt, pepper and either herbs and spices for the pork. Just apply it a few minutes before (or a few hours before) cooking. We use a bit of salt, pepper, garlic powder, chili powder, cumin and a few tablespoons of olive oil. But a mix of salt, pepper, fresh herbs, minced garlic and olive oil is also very tasty. 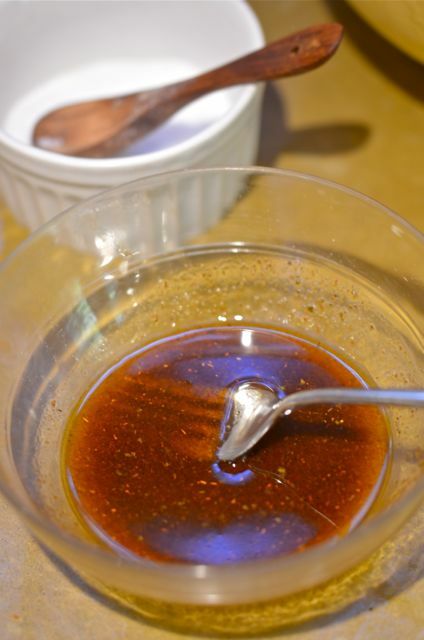 We avoid vinegar-based marinades as they will make the meat mushy and are not as effective as brines. Otherwise, cooking the tenderloins is still very easy. Preheat the oven to 450. Then place a skillet over high heat, add some oil and sear the tenderloins until well-browned on one side. Flip the tenderloins over and then place the skillet in the oven, or transfer to a baking dish, and cook until the internal temp reaches at least 137 (no trichinosis over that temp) for pink pork, or 145 for just pink. Remove the tenderloins from the heat, tent with foil and rest for ten minutes (the internal temperature will increase five to ten degrees). Slice and serve. If the extra brining time is a challenge, you can brine the pork a day ahead and then put the spice rub on the tenderloins and keep them in the fridge. The taste will only get better. Make sure your brine is chilled before using. You can make and chill the brine a few days ahead. Adjust the brine recipe for the type of salt you use. 1 cup of regular table salt or 1 and 1/2 cups of Morton’s kosher salt or 1 and 3/4 cups Diamond Crystal kosher salt per gallon of water. What You Get: Consistently tasty and very moist pork tenderloins. Also a great dish for small dinner parties, as you can do most of the work ahead of time. How Long? 4 – 6 hours, but only about 30 minutes of active time. Most of the work is making, and then chilling, the brine. With a little planning, this is an “anytime” dish. For the brine, place the ingredients into a large pot over medium-high heat. Bring to a boil and stir until the salt and sugar dissolve. Remove from the heat and allow to cool and then chill in the fridge until cold, 4 – 6 hours. To brine the pork, put the brine in a container that will hold both the brine and tenderloins. Add the tenderloins to the brine and then place them in the fridge for at least 45 minutes and up to 4 hours. (2 hours is a good starting point). Meanwhile combine the olive oil, salt, pepper, chili powder, cumin and garlic powder in a small bowl. Mix until combined. Set aside. When the pork is done brining. 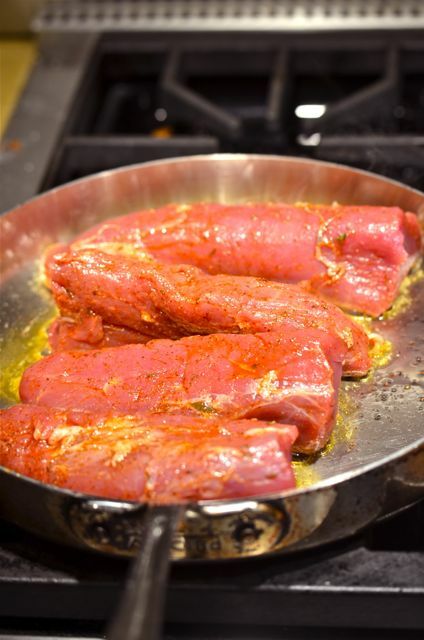 Remove the pork from the brine, dry it and then add then coat each tenderloin with the oil and spice mixture. Let the spice mixture sit on the pork, in the fridge, for at least ten minutes (or up to a day). 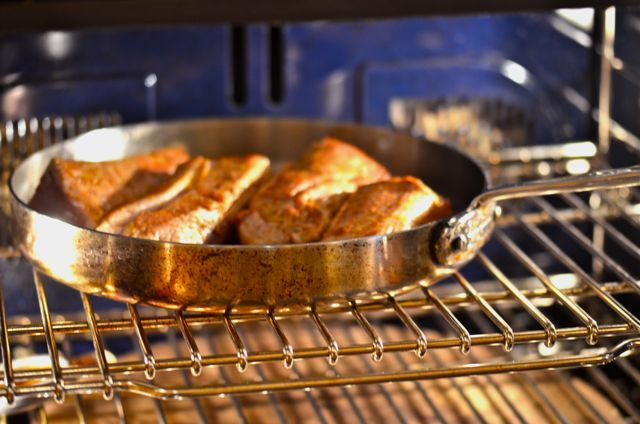 To cook the pork, place a rack in the middle of the oven and preheat to 450 degrees. Place a large oven-proof skillet over high heat and, when hot, add the vegetable oil (or bacon fat). Place the tenderloins in the skillet and cook until well-browned on one side, 4 – 5 minutes. Then flip the tenderloins and place the skillet in the oven. Cook the tenderloins in the oven until the internal temperature reaches 140 degrees for medium rare (light pink) or 145 for medium (very little pink), about 10-15 minutes. Then remove the tenderloins from the oven and place on a plate or cutting board. Tent with foil and let the tenderloins rest for at least ten minutes. The tenderloin’s internal temperature will increase 5 – 10 degrees during the rest. Slice and serve. What a wonderful dish … really like everything about it – and the photos make so appealing and tasty. This I will put on file for a dinner party. Wonderful post again. Big fan of pork. That I can understand – something I will do … when having guests around. I Will come back with verdict. 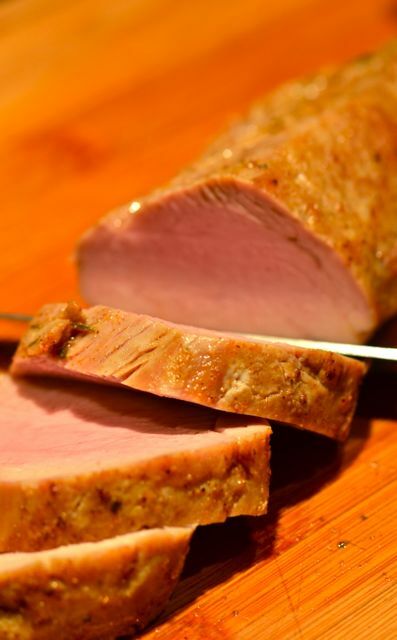 Great looking pork tenderloin with lots of pink! I’m not a big fan of brining and curing because it’s so easy to overwhelm the actual meat taste with salt and spices (with brining you replace part of the natural juices with the brine). Perhaps the two hour option will work for me. But your post has sparked my interest to try it again. Hmmm, I feel a side by side experiment coming up. Do you know how much time is needed at 137F to kill the trichinosis? I love medium rare, so I’d probably cook this sous-vide to 137F and keep it at that temp long enough to pasteurize. In a 450F oven it’s too easy to overcook, especially the exterior. Looks great! I think one of the hardest challenges with pork tenderloin is making sure it doesn’t dry out. The brining is a great way to do that (although I have no idea how the juniper berries affect the taste!). I’ve found tenderloin is pretty forgiving though because it always tastes good, even if the texture is a little off. Is there anything more satisfying than making a Sunday dinner that everyone in the family gobbles up and asks for seconds? This was a HIT! I left out the juniper berries and chili peppers opting for the middle of the road taste for the delicate palates in the group I kept the brining time to 2 hours, the rub sat for 45 minutes and it turned out perfectly. Slightly pink, moist, well flavoured and delish. Thanks for a keeper and making Sunday supper a pleasure. Excellent! Glad you liked it! And thanks for letting us know- we really appreciate it! I tried this tonight and it was really wonderful! This was my first experience with brining and now pork is a dish that all my family members enjoy. This was so easy and delicious. We will be using it over and over again. Hi I was wondering if you could change the pingback link for my pork tenderloin? I have updated my site and the link no longer works. Here’s the new link. http://twobroadstravel.com/pork-tenderloin-wrapped-in-bacon-pork-the-only-white-meat/ Thanks so much.